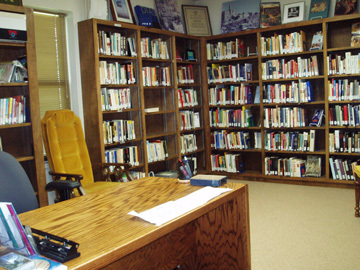 Our library currently has over 2,000 titles from which to choose. There are sections for children including holidays, stories and information, adolescent fiction, adult fiction and non-fiction, music cds, tapes and videos, and a reference section. All but the reference books may be checked out. Hours: Books can be checked out any time the building is open for services, meetings or activities. Due Dates: There are no due dates unless the item is needed by another person. We request that an item be returned when it is no longer needed or six months, which ever is sooner. How to check out: Place your name (printed) on the card as well as your phone number. Also include the date it was checked out. good condition. To donate, print your name and contact information on a slip of paper attached to book(s) and any dedication you might like to have inscribed on a book plate inside a book. Synagogue with the work “library” on the information line below the amount.